This part wasn't introduced until 1914. 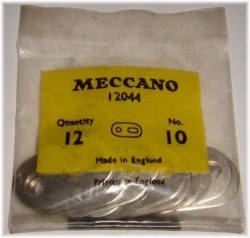 Once it was introduced, however, it became one of the very few Meccano parts included in every single outfit made, even the tiny 000 and "Pocket" Meccano outfits. It was named "Flat Bracket" until 1945, when it was renamed "Fishplate". The very first flat brackets were thicker gauge steel, almost rectangular, with slightly rounded-off corners. Very soon after they were introduced they were changed to the fully-rounded ends we're all familiar with. Since then there have been no significant changes other than to the finish. The blueprint for this part shows it as being manufactured from 0.24'' half hard steel, originally drawn up in June 1915. The drawing to the right originates from 1944, when the fishplate was known as the "flat bracket". It is interesting to note that the blackened finish ("Brunofix"), necessitated by the restriction on the use of Nickel during the Korean War, was in place until February 1954. It is commonly thought that this finish was only used during 1951-52, but this blueprint would seem to indicate that it was used all through 1953 as well. I have some dark blue metallic small parts too. Actually, if you look at the 1 set manual from 1978, the pictures of models in colour show various small brackets in dark blue instead of the more usual dull brass (iridescent appeared later)even though those on the front colour show dull brass. I'll partially confirm Tim's metallic blue 10s: I've a pair in DB and both the colour match and finish make it look factory applied. Painted fish plates sometimes show up in pre-war colours. I have an example in dark green. During the pre-DB/Y period when various experimental colours were tried at the Factory, Meccano spray-painted up a batch of both fishplates and large washers in a metallic blue, along with the usual strips and girders.